We’re thrown into the dark canvas of space. Tiny stars sparkle in the distance, embedded in the exotic surrounding. As the camera gradually leans down, our eyes lie on the blue horizon of a gigantic planet. For a short second, the orchestra music in the background becomes nearly inaudible. It’s a peaceful shot. A small spaceship, loudly perused by the sound of laser fire penetrates the serenity of the moment. What next unfolds is a massive, grey battleship - the Imperial Star Destroyer - chasing the nice little ship into the darkness of the galaxy. The Star Wars opening shot mesmerized millions of people. Back in 1977, the shot “was such a great way to start a film, and it caught the audience off-guard,” said the artist Joe Johnston, in a 2012 interview for Star Wars Insider. But while opening shots capture the viewers’ attention at the beginning of the movie, the real question is, what keeps them engaged until the end? Consequently, Cutting reveals that the average shot length in English language films has been declining. In 1930, movies had an average shot length (ASL) of about 12 seconds, while today, the ASL is approximately 2.5 seconds. 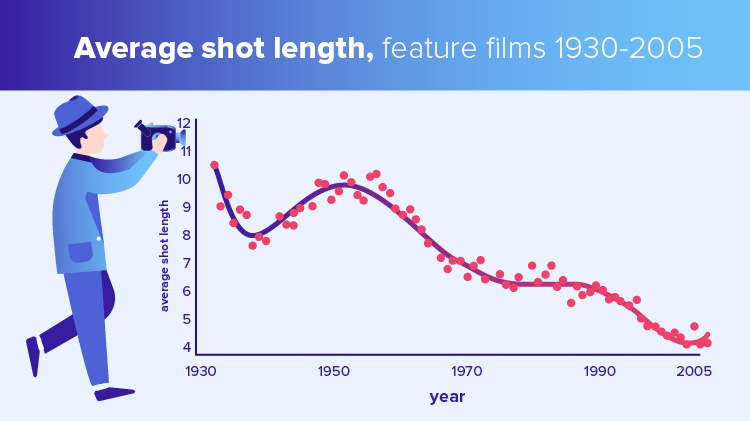 The research team measured 160 English-language films released from 1935 to 2010, and among other things, they discovered that contemporary films have more motion and movement and a shorter shot length than earlier films. His Girl Friday (Howard Hawks, 1940) – ASL of 15 seconds. The Apartment (Billy Wilder, 1960) – ASL of 16.3 seconds. Jurassic Park (Steven Spielberg, 1993) – ASL of 6.2 seconds. Inception (Christopher Nolan, 2010) - ASL of 3.1 seconds. Lessons from filmmakers: How can the digital learning industry convey effective learning strategies? When Gloria Mark, professor in the Department of Informatics at the University of California, Irvine, and her colleagues, shadowed 36 managers, financial analysts, software developers, engineers, and project leaders for three days, they made some significant discoveries. Namely, each employee got interrupted after only 11 minutes of work, with a demand unrelated to the task at hand. What’s even more interesting is that on average, the employee needed 25 minutes to return to the task after the distraction occurred. Which means, in a 60-minute long video study session, the employee can expect at least five interruptions. Counting the time it needs to get back to the video, a one-hour long video could take over three hours to digest. But that is not the only problem. Even if the employee doesn’t get interrupted, research shows that the average adult can sustain their attention for approximately 20 minutes (Dukette and Cornish, 2009). To keep the audience interested, the video should not only be shorter, but made up of different shots averaging around eight seconds each. A report published by Tubemogul in 2008 indicates that when viewing online videos, nearly half the audience is gone by the 60-second mark. The report shows that most of the time, getting to the bottom of the problem through a short, 90 second story is more efficient than through a dull, long video. Adding to that, only 37% of people finish a 3-4 minute online video, which leads to the conclusion that “shorter videos are better for getting people to watch the whole thing. “ (see infographic). Length of video– Using the Twitter approach, Vibons removed repetitive information, fillers, and irrelevant data to fit valuable lessons about open enrolment in a 5-minute animated video. Vibons produced the video in only ten days, achieving a 74% completion rate after a month of training. Average shot length – In the video, Vibons never exceeded the attention span rule, stimulating the viewer every eight seconds by using storytelling, motion effects, infographics, and animated visual metaphors. Short, but problem-solving – “When employees are stuck, they need the answer quickly. It doesn’t help them to sign up for a class that will happen three weeks from now and sit through a four-hour session to get the answer they need this minute,” says Britt Andreatta, Ph.D. Consultant, Speaker, and Top LinkedIn Learning Author. Storytelling – In training videos, Vibons focuses on only one strong character, highlighting one area at once. Click here to read more on how to use digital storytelling to enhance workplace learning. Microlearning is the new approach to corporate training. According to the 2017 LinkedIn Workplace Learning report, seven out of ten organizations are starting to incorporate video-based online training into their learning cultures. Are you one of the seven?